Congratulations to Elie Payan, Winner of Event #22 ($292,825)! It's all over folks and another one is in the books. Elie Payan from France has earned himself victory in Event #22: $1,500 Pot-Limit Omaha and a whopping $292,825 in cash. 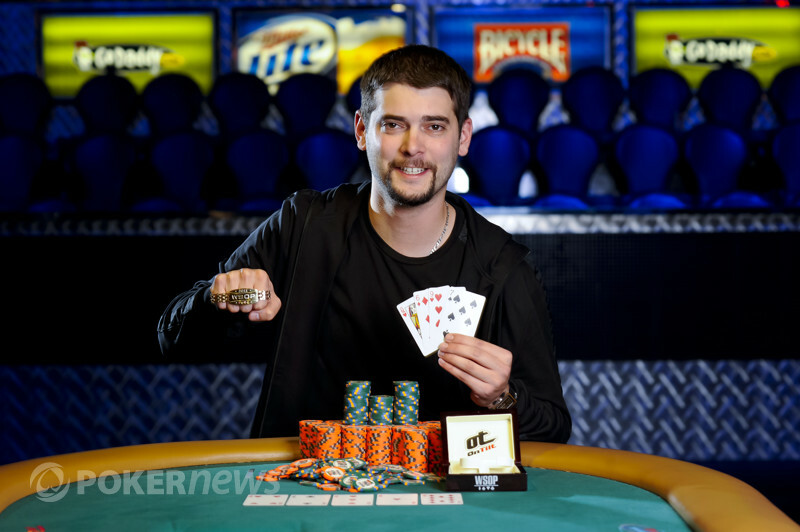 Not only that, Payan now has a World Series of Poker gold bracelet wrapped around his wrist -- the most coveted prize in poker! When the day began, Payan was right in the middle of the pack, but he was a little late to the party. Payan missed the entire first orbit of play before he showed up to the final table and played his first hand. That didn't matter though, as he was the last man standing on the felt with all the chips in front of him. Payan defeated Rafe Kibrit heads up, but it wasn't easy. The two battled back and forth, swapping the lead a couple times. At first, Payan held the chip lead heading into heads-up play, but then Kibrit fought back to take pole position in the match. Payan never gave up though and fought his way back in front and then steadily applied the necessary pressure in order to finish off his opponent. 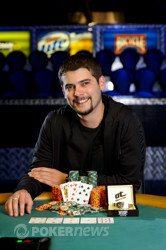 Congratulations to Elie Payan, the latest gold bracelet winner at the 2011 WSOP! Elie Payan captures the bracelet in event 22. Rafe Kibrit began this hand with 1.025 million in chips and raised to 180,000 after Elie Payan limped in from the button. Payan made the call and the flop brought the . Kibrit fired a pot-sized bet for 360,000 and Payan re-potted it to put Kibrit all in. Kibrit made the call and he was at risk. The turn brought the and although it gave Kibrit a set of aces, Payan nailed a heart flush. Still, the board could pair on the river to give Kibrit the double up. The river completed the board with the and that was it. Payan had made his flush and it held up, allowing him to eliminate Kibrit from the tournament in second place and more importantly win the tournament. For his runner-up finish, Kibrit earned $181,222. With the board reading , both Elie Payan and Rafe Kibrit had checked the whole way down. After the dealer dropped the on the river, Payan fired 300,000 at Kibrit, who mucked his cards. As has been the pattern in this heads-up contest, Payan is currently riding a hot streak, but if the past few hours are any indication the momentum may just swing at any moment. Rafe Kibrit raised from the button, making it 100,000 to go and Elie Payan made the call. The dealer flopped the and both players opted to see another card, checking it down. The turn was the and Payan fired 80,000 into the middle. Kibrit came along and the river fell . Payan led out for 315,000 and Kibrit studied for a minute or so before looking the Frenchman up. Payan tabled the for a backdoor flush and Kibrit mucked his hand. 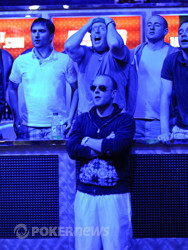 Rafe Kibrit stands near his rail as they shout for a double up card. After being pushed around during the last few hands, Rafe Kibrit pushed back and raised to 100,000 from the button. Elie Payan was not impressed and three-bet to 300,000, a bet which Kibrit called. The flop ran out and Payan bet the pot of 600,000. Kibrit had enough of Payan's power plays and reraised all-in for his last 825,000 and Payan quickly called to put Kibrit at risk. Payan was in the lead with his pair of queens and he had a flush draw to boot. Kibrit held just a pair of tens and a gutshot straight draw and needed help to arrive on the river to survive. Kibrit's help had arrived in the form of a non-spade nine, giving him two pair for the double-up. The match is now nearly even again after both players had staked themselves to huge leads in the last few hours. Elie "Punisher934" Payan has wrested control of this match back from Rafe Kibrit and now he is punishing him with preflop raises and three-bets. Kibrit is visibly frustrated with this turn of events and Payan has kept the pressure on. Rafe Kibrit raised to 100,000 from the button and Elie Payan came along for the ride. Payan led out for a pot-sized bet of 200,000 and the action escalated in extreme fashion. Kibrit announced "re-pot" and before he could even touch his chips Payan repeated the phrase, making a massive reraise. Kibrit shoved his stack forward, flipped up his for two-pair, tens and sixes. Payan tabled the for a flush draw and an open-ended straight draw, giving him plenty of outs to take the lead. One of Payan's plethora of outs was delivered and his rail exploded in celebration. Kibrit would need to fill up with a ten or six on the river to claim the victory. The river was a brick and Payan scored the massive double up, swinging the momentum in this match sqaurely back in his favor. He now sits with over 3,000,000 chips and, despite his Herculean efforts in staging a comeback, Kibrit finds himself right back where he started entering heads-up play.